The Port Wine Trail begins in the only place legally authentic Port can begin, in Oporto, Portugal’s second-largest city, and a three and a half hour train ride north from Lisbon. 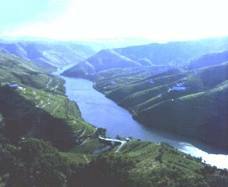 More importantly, it’s the gateway to the Douro Valley’s prized Port wine vineyards. The valley is really spectacular, a “must see,” and certainly a absolute destination for any lover of Port. The hills are carpeted with terraces of grape vines that rush and fall away, down toward the river’s banks. The best way to take it all in is probably one of the many Douro River boat rides or the very charming, tiny steam train that winds through the valley. If Vasco do Gama, Magellan and Henry the Navigator fortified themselves with Port, the country’s most famous product, it might have made their journeys less horrific. But what it controls today is perhaps more precious. Oporto itself is an elegant, old city, rich in Baroque cathedrals, winding, cobblestone streets, twisting alleys and huddled 17th century homes, still inhabited by the original families. At night, it’s even more artfully lighted than Paris. The lighting scheme dramatically illuminates the old cornices and Rococo facades, and in the bright light of day, colorful bits of laundry wave in the breezes from the river. The city was declared a UNESCO site in 1996 because so much of the town is still authentic. Port is wine to which a “grape spirit” has been added to “fortify” it. Originally designed to protect the product during it’s long Atlantic sea voyage, the addition of the “grape spirit” also stops the fermentation process, allowing the Port to age without “turning,” resulting in a a full-bodied, rich beverage. The classic “pairing” for full-bodied Port is cheese: blue cheeses such as Stilton or Roquefort in particular, or with desert at the end of the meal. But truthfully, today’s Port aficionados are drinking it anytime and with whatever pleases them. Thanks for the comment. We too, obviously, are convinced Port is a wonderfully adaptable drink and suffers from lack of publicity. We look forward to another trip to the Duro Valley to explore and sample more!